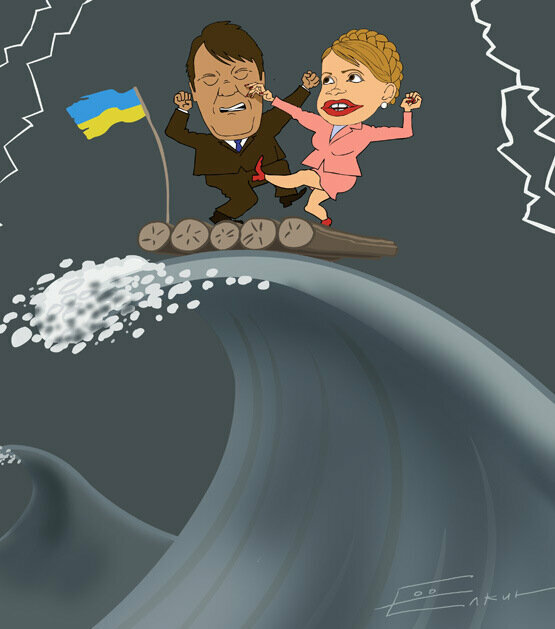 Sergei Elkin (spelled yol-kin) is the king of political cartoons in Russia, famous for his satirical takes on Russian, Ukrainian and world leaders. What sets him apart from Kremlin propagandists is his relatively balanced and multidirectional approach. Here’s how he frames the U.S. presidential race. 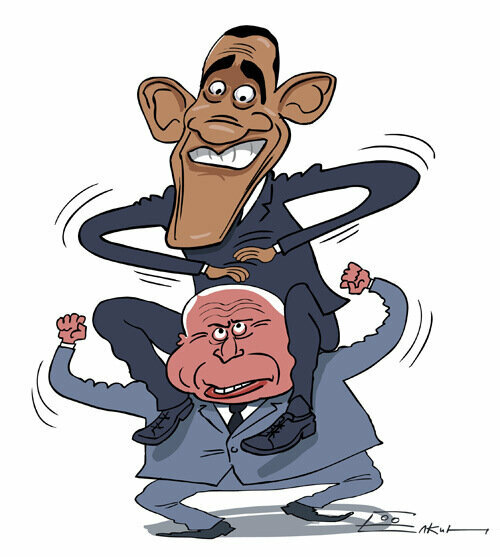 “Plan Putina” refers to Putin’s Plan; the cartoon addresses Palin’s recent remark on Obama and Ukraine. Please post more topics about Holodomor. The more I read about it, more I am convinced that the famine was purposely engineered by the Soviet authorities as an aatempt to wipe out Ukrainian people from SSR. Remember what happened when Georgia stood against Russia? The first counter-measure Russians used is economic blockage. Of course, they can't starve Georgians, but remember, Ukraine was part of Russian "empire" and they could have done whatever they wanted with it. It was a silent genocide engineered by Russia. Lets NOT forget victims of Holodomor! I’ll do my best to attend the commemoration ceremony this November, as I did last November. Unlike Germany, which took responsibility for crimes against humanity committed by the Nazi regime, Russia takes no responsibility for such crimes committed by the Communist regime. Being the sole successor to the Soviet Union, Russia actively obstructs Ukraine’s international efforts for the recognition of the Holodomor as genocide. To this end, Russia uses its veto power in the UN and co-opts the governments of “Old European” countries that rely on Russian gas and share Russia’s dislike for the U.S. In the EU, Russia also mobilizes Russia-leaning politicians and journalists, some of whom merit the term EUkrainophobes. This strategy of Holodomor denial has shown impressive results. Recently, the EU parliament recognized the Holodomor as “a crime against humanity ,” but not as genocide. Peace protester: Disband hair and bring the troops home!